This is a super short blog post, as I didn’t go overboard making a bunch of different combos for a change, but I wanted to show this kit because it’s so colourful for the summertime. 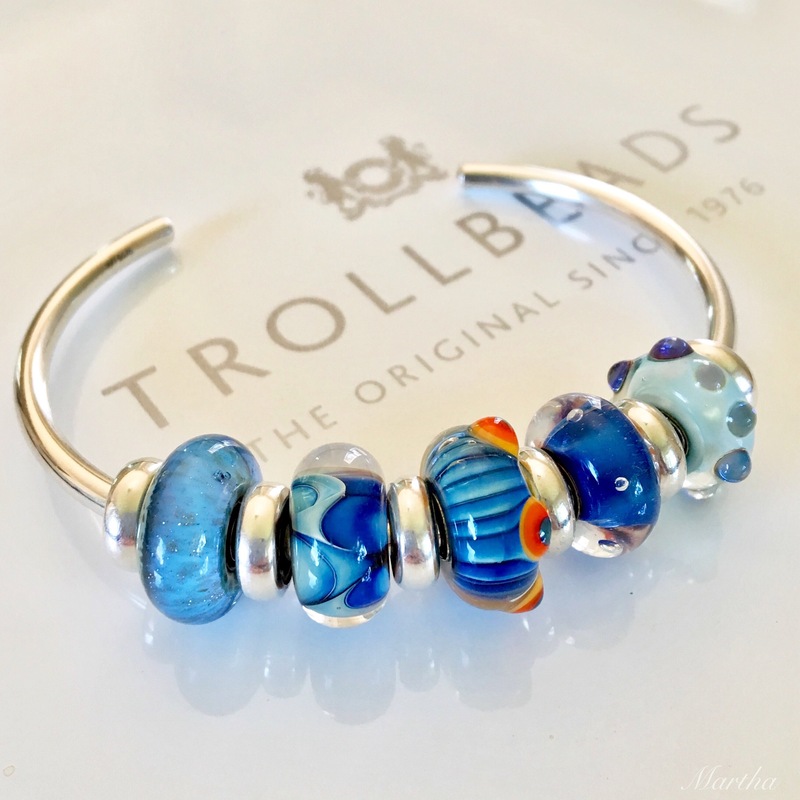 A while ago I bought the Trollbeads Dreams of Freedom Kit because I liked how bright and whimsical it is. It is designed by Gail Crosman Moore who also designed the Native Elements Kit, which I also love. As with all Trollbeads glass kits, you get 6 beads for the price of 5. Here they are in a Brady Bunch style grid. Looking at the top row, they are called Hopeful Poppies, Stamen of Life, Flaming Meditation, Dream Away, Unbreakable Ties and Spiritual Cone. They look fabulous together on a bangle in the sun! I thought that the beads with red would work well together. I like the Gold Spacers with the yellow glass. Lastly, I made up another bracelet for #bluejuly2017 using the Dream Away bead as the jumping off point. Those are Light Blue Turquoise Prisms on each end. The other glass beads starting on the right and going clockwise are Seabead Anemone, Whitecap, Ice Blue Bud, Cool Dusk, Blue Fizz and Ancient Palace. That’s is for today, although there must be so many ways to use the beads in this kit. Say, did anyone pick up anything in the recent Trollbeads USA sale? On Monday I’m going with my girlfriends to the Trollbeads store in Michigan! I plan to buy 4 beads-probably glass ones, although I’m hankering for some Pink Pearls after seeing @evepink123’s gorgeous combos. I swear we could all save money by not looking at each other’s bead photos! Oh! If you live in NYC I’ll be at the Trollbeads Store there on Saturday, July 22 from 12-4 and would love to meet up! And I’ll get to have beads n’ coffee with April of Charm Bead Blog in the morning! Can’t wait! I really like this kit and all of your stylings Martha! 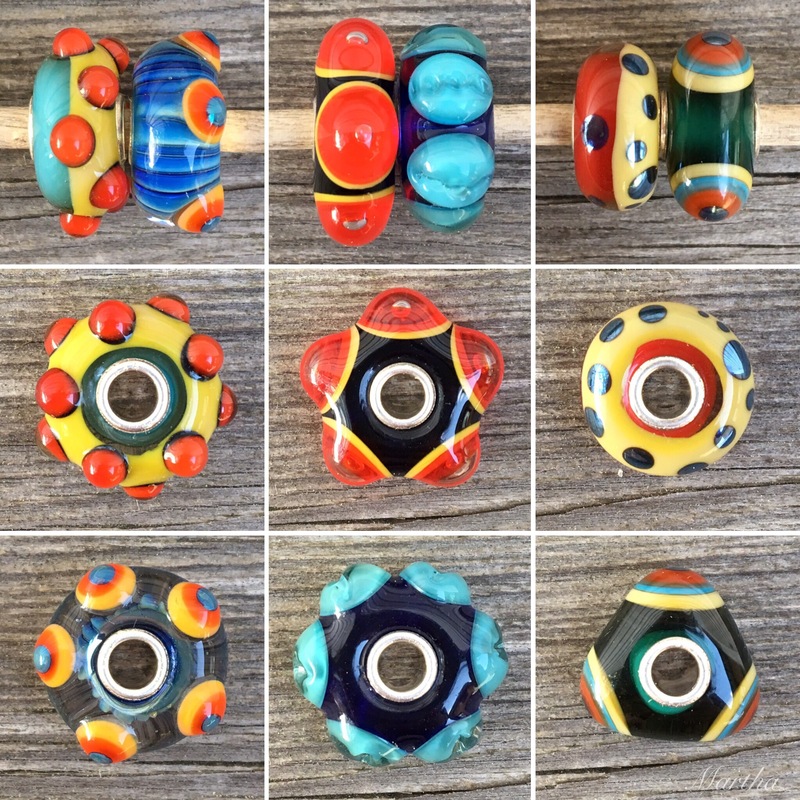 Trollbeads truly are amazing and I am excited to be going bead foraging with you all next week! It’s going to be so much fun, Sarah! I’m really looking forward to it! Have a great trip to Michigan! That’s always fun to do; I’ll be interested to see which beads you decide to pick up. I am lucky to have a Trollbeads retailer close to me (I can walk! 😱 ), but I would LOVE to see a full Trollbeads store. I wish I could pop over to NYC to see you there lol. 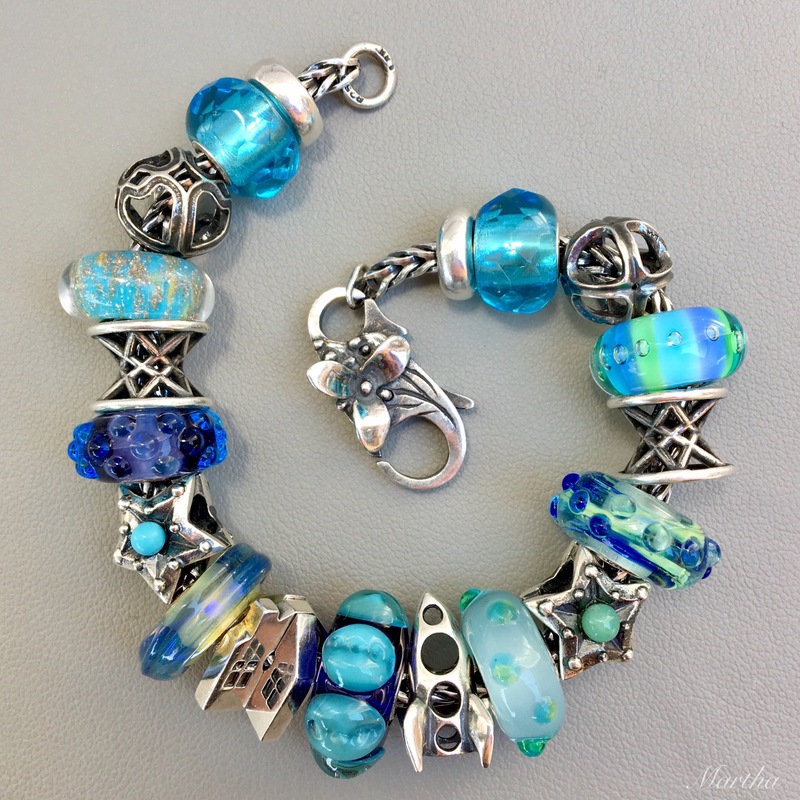 Your last bracelet of this post – the blues – is my favourite. I’d wear it with a jean shirt or denim jacket for sure! Oh my, I would be toast if I could WALK to a Trollbeads dealer! The branded stores are so beautiful. There is a green moss wall and lots of shiny black and white. Just search ‘Trollbeads artisan event’ on my blog and there are pictures of the Michigan store! I’m glad you like the blues bracelet-I’m wearing it right now. Too bad Canada is SO big, otherwise it would be fun to meet up! Hi Martha, I love these beads and the Native Elements Kit because they are so different from what I have right now. I love to look at everyone’s bead photos, but it would be a lot easier on my wallet if you could all stop doing it! ( not really!!!). Very often I will see a bead that I love in a photo, but I don’t know what it is, causing me to obsess until I figure it out. 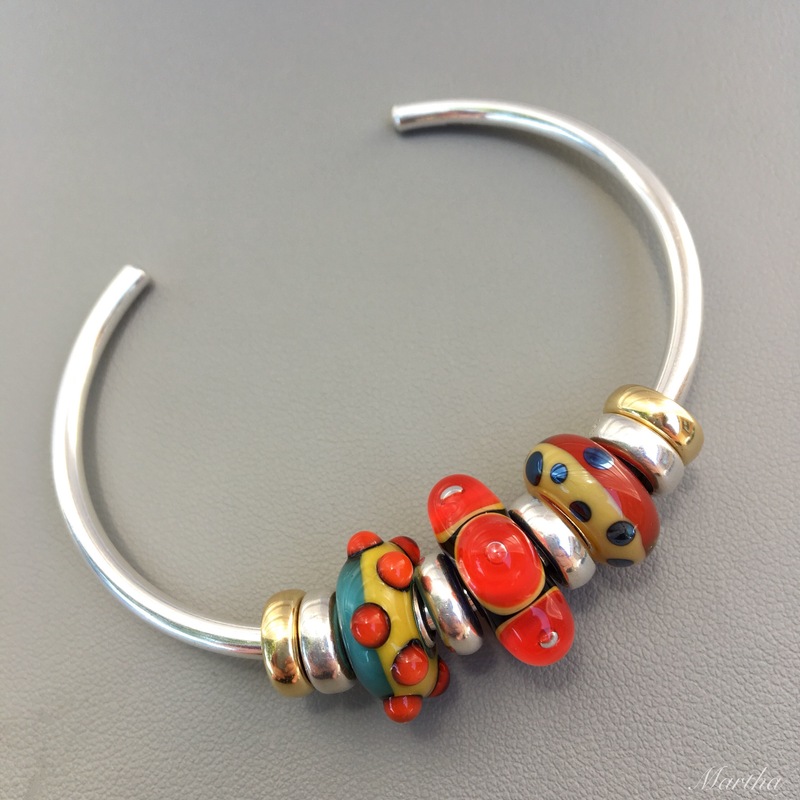 I didn’t get any Trollbeads this month….I’m into Ohm beads right now and got some retired ones. I’m actually trying to copy a combination you did with Confetti Upchuck and some Rivers of Life beads. I know I will never find the original Cold Milk that you used so I’ll have to figure something else out. See, here’s a perfect example of what your photos cause!!! Hi Suzanne! Yes, these beads are very different, but so much fun. Those Cold Milks are definitely hard to find. The True Beadz Siberia line is pretty much the exact same shade of white-not sure if you’ve considered that as a substitute. 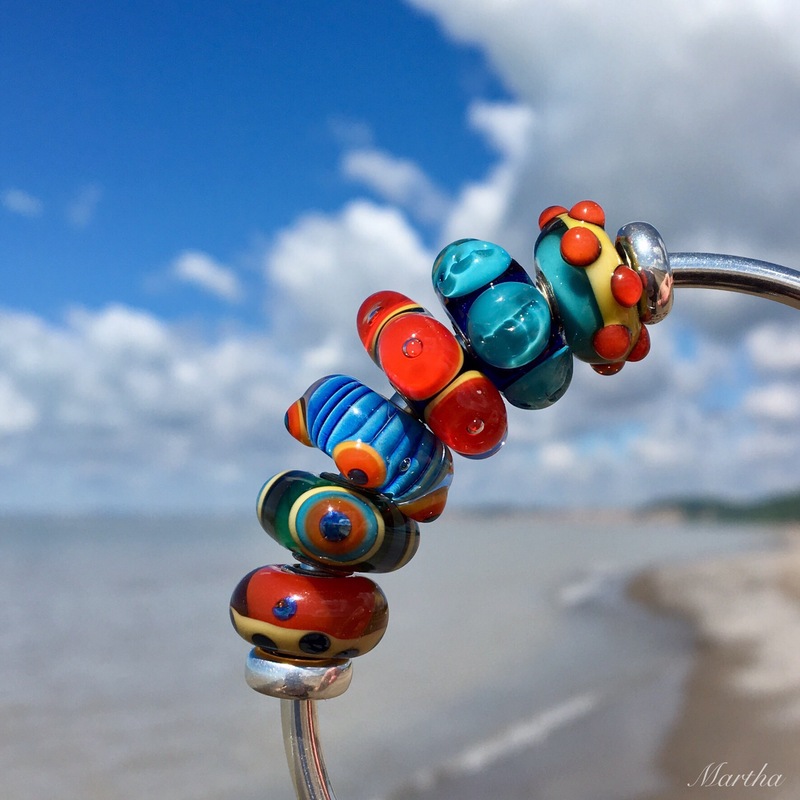 I hadn’t even thought of the Siberia bead, Martha! Thank you. And I actually have it already. Now I just have to wait for one of the Ohm beads to arrive so I can put it together. I was very surprised that I was even able to find Confetti Upchuck. Great! Sounds like a fun bracelet! Great and bright combinations! Can’t wait to see you! Me too! Am so looking forward to beads n’ coffee!